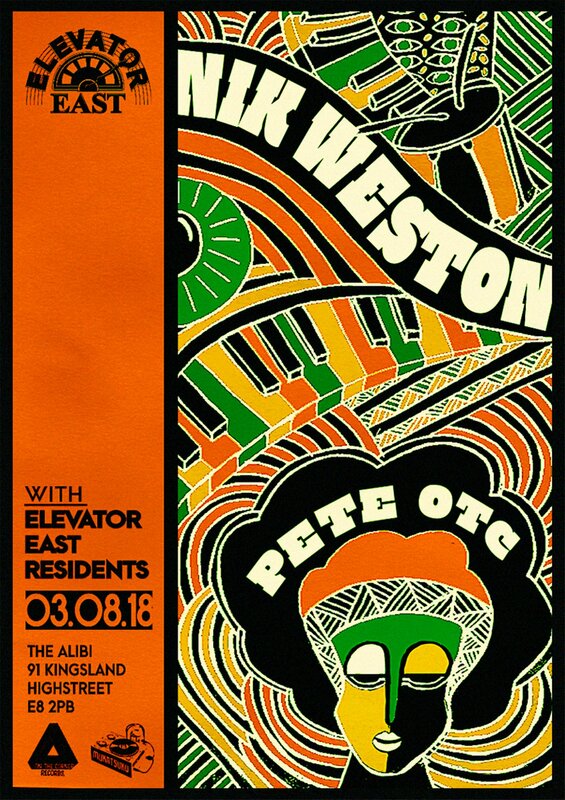 Here’s Hugh Helmore with his review of East London party Elevator East at The Alibi, 3/8/18. Set deep under the streets of Hackney, The Alibi is a small but somehow confusingly crawling space of inner city caverns, serving to entrap its audience in it’s intoxicatingly muggy sun-bleached atmosphere. Every available wall surface is brought to life with miniature arabesque inscriptions of names, places and labels, etched in with the familiar 2.5D look of classic marker pens. The venue lives and breathes as its inhabitants do, which makes it a beautifully snug fit for music of a similar calibre. Owner of Mukatsuku Records, Nik Weston, kicked off the evening with the first set, letting loose with a compact vinyl-only collection of African and Caribbean based grooves. The tone of his set sounded beautifully with the late summer evening, cutting through the heat and drawing people in as the complex, intertwining beats drifted up the stairs and out into the street. It’s often rare for a DJ to nail the opening set, insofar as it requires the ability to have a mix of fresh and invigorating records alongside more nostalgic classics to accommodate for a majority crowd, all whilst maintaining a middle ground between filling the floor and allowing conversation. On top of this there was a definite exhibition of technical prowess, with Nik weaving nonstandard time signatures of odd beats together effortlessly, setting a high bar for the set to follow. Pete Buckenham filled the second time slot of the evening, taking over from late night and pushing forward until the early hours of the morning. Pete’s set was more house and funk orientated, taking the music from soulful to tribal and inviting the rest of the crowd onto the dance floor for the remainder of the night. His selection featured a few contemporary classics blended neatly into select underground cuts from On The Corner Records, inspiring a dark yet lively atmosphere, extremely conscious of the tight and winding venue. In a packed-out dancefloor at 3am, with sweat dripping off my face, I felt that distinct joy in the air, a feeling of cultural contribution that’s often lacking in larger, less community orientated clubs. The refreshing record collections that fuelled the night paired excellently with a wonderful crowd who were evidently incredibly supportive of an art that they took great pride in being part of. A very special party of the kind that we need to see more of in East London. Make sure to RSVP to the next Elevator East party at Hackney Wick’s White Post (25/8/18)! Event link here.